FEATURE — Do you have an old bike sitting around the garage you don’t know what to do with? If yes, I have the perfect solution for you. If no, you’ll still want to read on and learn about an inspiring effort that has recently sprung up in Southern Utah. To do this, the collective focuses on providing refurbished bicycles especially to lower income households and teaching bike repair skills to both adults and kids. The collective also has chapters in Ogden and Provo. Dannielle Larkin, one of BCSU’s organizers, said Southern Utah is one of the best cycling environments a person could ask for. The area is ripe for the organization’s activities, all aimed at getting more people out on bikes. Essentially, the idea is to “recycle” by taking in bikes no longer in use or that are falling apart, and fixing them up to give to those in need. What a fabulous way to interconnect the community, and that through something as simple and yet profoundly beneficial as a recycled bicycle! This approach hits home for me, one who saves things just in case they might come in handy again. In my last column, I mentioned my messy garage. Well, amid that mess is a box full of bike stuff. There are old bike lights, toe clips, reflectors, tools, my first helmet, a front handlebar basket, new and old tubes and a set of pedals. I can recall every bike I’ve had (purple girl’s bike, bright green Schwinn Varsity, charcoal gray Univega road bike, aqua blue Novara mountain bike with slicks that served as my commuter bike during graduate school until it was stolen, and my three current rolling steeds. I hope the past ones each found a next phase of life after my time with them (on the bright side, I’m sure the stolen bike did). BCSU actually catalyzes this kind of a hope. 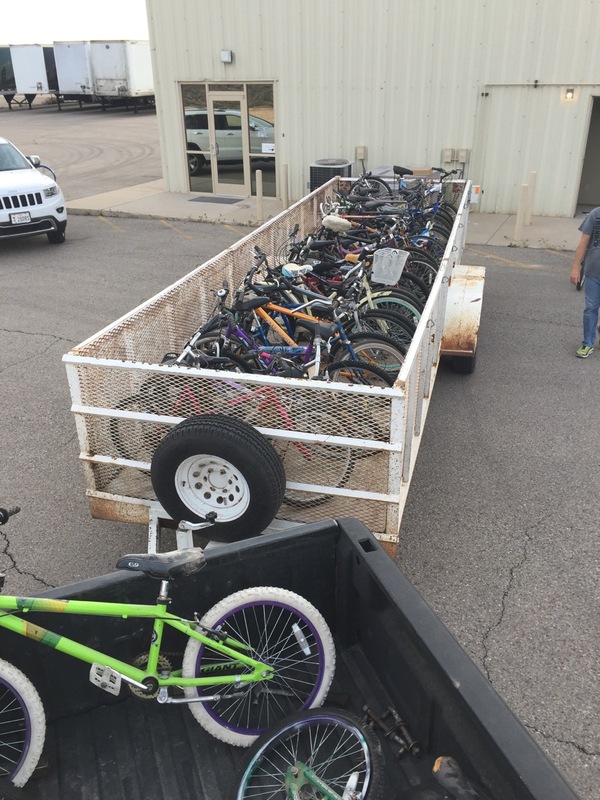 Since its initiation in March, the collective has developed partnerships with the City of St. George (which donated a large number of unclaimed bikes it had been accumulating), area bike shops, the Southern Utah Bicycle Alliance, Switchpoint Community Resource Center and many community volunteers. In addition, the Washington County Drug Court will start connecting offenders who have lost their driver’s licenses with the collective, opening up the opportunity for them to acquire bicycles. Helping repair bikes (one can work to “earn” a bike). Buying a rehabilitated bike (they range from $25 to $100), with all proceeds going into buying more parts and tools. The opportunity provided by BCSU for people to learn to repair bikes benefits those seeking job skills, the average recreation rider or commuter and kids who can even earn their own bikes. 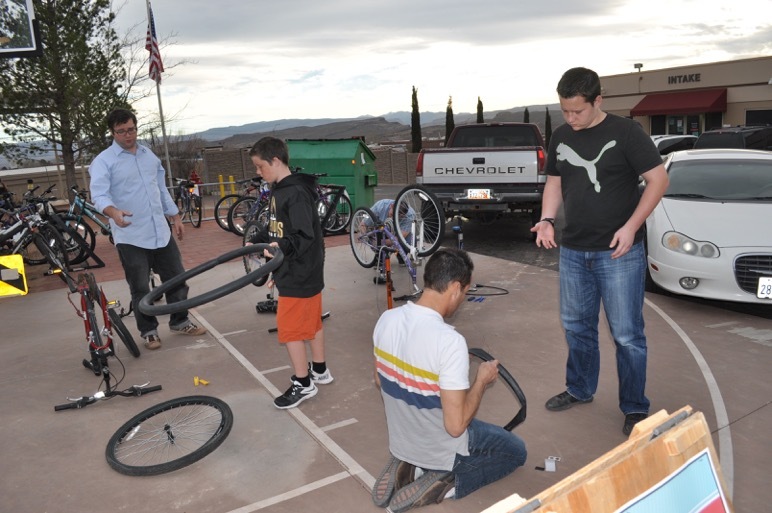 Currently, the group has a space in St. George to use for storing and repairing bikes, but it is looking for a more permanent location. For its next event, BCSU will host a bicycle clinic on Aug. 13, from 9-11 a.m. at the Switchpoint Community Resource Center, 948 N. 1300 West in St. George. Twenty-five refurbished bikes will be given to Switchpoint residents who have earned them by doing a designated amount of work at the center. Members of the public are invited to bring bikes they would like to donate or to bring their own bikes and learn how to perform repairs on them. There will also be bikes for sale (BCSU has about 25 bikes for sale right now). In terms of old bikes, the sky is the limit. “You can go to almost any house and find an out-of-commission bike,” Larkin said. It’s just a matter of mobilizing the network so these bikes and parts (like those in my garage) can find their next useful lives and generate the ripple effects of a healthier lifestyle and cleaner, more sustainable environment. This is the collective’s joy-filled work. 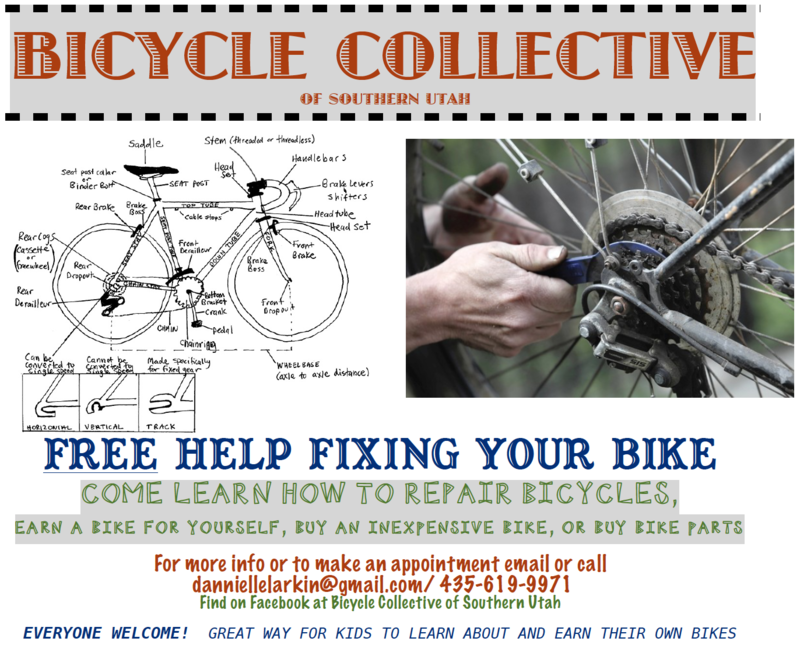 If you have a bicycle you’d like to donate to, if you’d like to buy a bicycle from BCSU or if you’d like to get more information about the collective’s repair clinics and other activities, contact Dannielle Larkin by email to danniellelarkin@gmail.com or by telephone to 435-619-9971. Information is also available on BCSU’s Facebook page. Who are you and what have you done with Dotboy? The meds. It’s the meds.